A South Carolina Treasure--A Story of Strong and Courageous Faith. 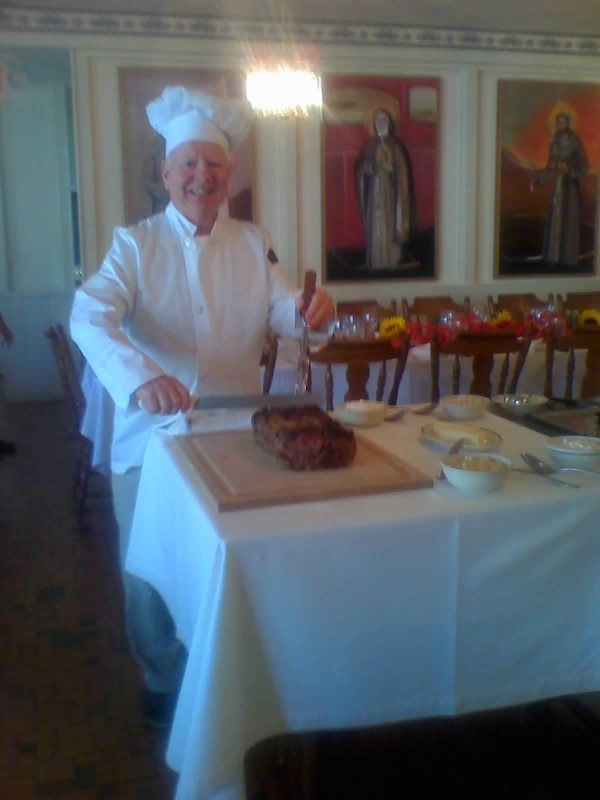 During the past week I have been with Fr. Marty Bednar preaching a mission at St. Anthony's parish in Walterboro, SC. In preparing for the mission it was explained to me that there was a mission of the parish comprised largely of African Americans. It is not uncommon in the southern US to find a church or chapel that was once all black by virtue of segregation, but which chose to continue its largely African-American heritage while welcoming all people. We found that, but so much more at the church of St. James the greater in Walterboro. It seems that in 1835 three prominent women of the area converted to Catholicism and brought many of their slaves into the Church with them. 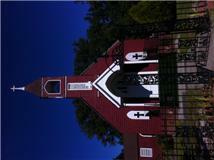 They built a small Church dedicated to St. James the Greater on their land. The real story begins in 1856 when that Church burned to the ground. With the civil war soon following the community there was neglected until 1897 when a Fr. Daniel Berberich came across an incredible group of former slaves and their descendants who had kept their Catholic faith alive during that nearly 40 year period in spite of there having been no priest. Local tradition credits a former slave, Vincent de Paul Davis with preserving the faith in the area. His descendants and those of other original families still belong to the parish. The Church was destroyed again by a tornado in 1935 and the present structure was built with many artifacts there from the older buildings. Saturday. Several of them joined us for the mission at St. Anthony's here as well. This is one more example of the great inspiration I receive as I travel around preaching with the Franciscan Ministry of the Word. Greetings from Little Rock, AR where I'm spending two weeks preaching missions in English, then in Spanish. 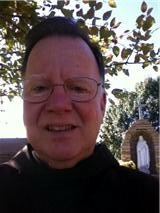 I have been enriched over the past few weeks by receiving daily meditations from Richar Rohr, OFM, a brother friar who lives in Albuquerque, NM. He reflections are brief, easy to understand, bur profound and thought provoking at the same time. 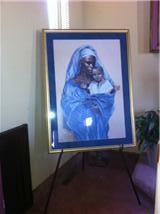 Over the last few days the meditations have been on "Unity" as part of a Franciscan vision of life. The basic idea is that for Francis of Assisi all things mirrored the creator and even praised the Creator by their very exsistence. We humans, being creatures, are one with all things in God. This creates a perspective for respecting all creatures and thus caring for our environment as well as for seeking unity with other humans rather that trying to separate ourselves from them. You can click on to the following link and subscribe to his meditations as well as other resources. Richard Rohr, OFM. A practical challenge to living this message came my way the other day when i was referred to a campaign called. Drop the I Word. Again you can click to see more of what it is about Drop the I word. I work regularly with fine Catholic people who happen to be undocumented. This campaign does not deny that there is a problem to be worked on in our country with immigration, but it realizes that simply calling people "illegals" dehumanizes them and feeds into fear and hatred. I encourage readers of this blog to consider making the suggested pledge. I believe that you can do that regardless of your political leanings on this issue. Going back to Richard Rohr's thought we need to realize that these are human beings, our brothers and sisters, in many cases our fellow Catholics as well. Treating our immigrants as brothers and sisters, not as "others and outsiders" will do more for leading us to a solution rather than emphasizing what divides us. This is a truly Catholic and Franciscan vision to be sure. Look to the right side of this blog to see the US bishops Immigration Reform link as well as the Franciscan Action network. It is under the banner of "Links to my World" I look forward to your comments. Yesterday our community here at St. Anthony Friary celebrated the feast of St. Francis. The celebration began on Sunday night with a ceremony that we Franciscans call the Transitus. Transitus is a Latin word for Passing and the ceremony recalls the death of St. Francis. Yesterday we had a wonderful Mass and a great dinner afterward. I was asked to do the honors of slicing the nice selection of beef that was served. I thought you might enjoy the picture to the right. For several days I have been drifting between several thoughts about Francis that I might share with you. Francis, like many saints, was a many faceted man. He loved animals and nature. He loved lepers and other poor people. He loved the Church and above all he loved the Lord. One of the blogs that I link to on this page is Whispers in the Loggia. 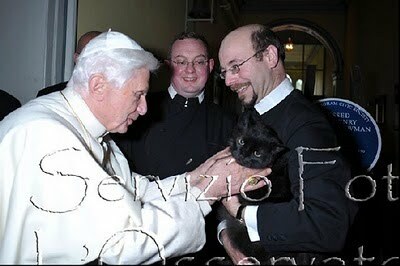 If you go to that you will notice that there is a reference, with Francis in mind, of Pope Benedict's love of cats, as well as one recalling Francis initial call to "Go and Rebuild my house, for it is falling into ruin,"a timely reference in this era of so many calls for Church reform. Whispers in the Loggia2 I would like to comment on both of these aspects of Francis' life and the role of our order in the Church and in the word. 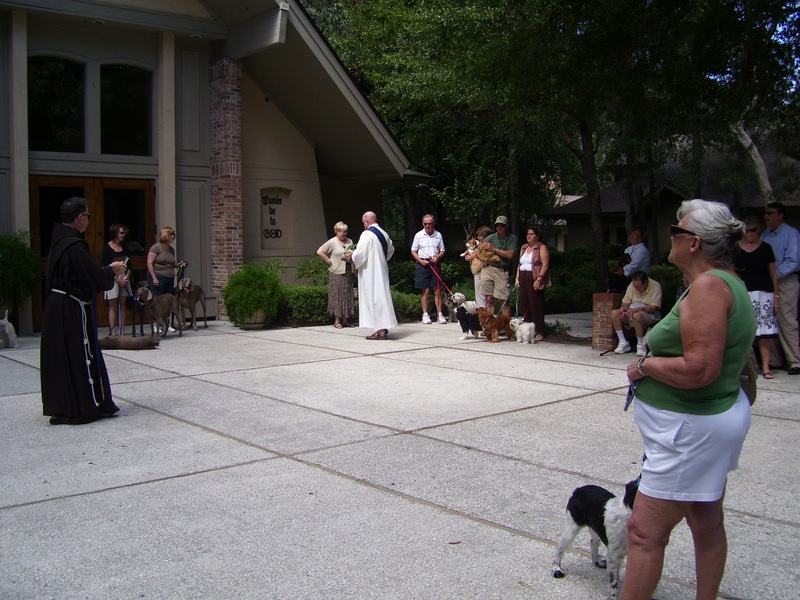 Many Franciscan Churches celebrate the blessing of animals on or around this feast, including St. Mary's here in St. Petersburg, run by the Third Order Regular friars. Some of our friars from St. Anthony's help out with this each year. At one time I considered this practice nice, but kind of silly. My thoughts have changed greatly over the years. In addition to the fact that it draws young people and families it highlights an important part of Francis life and of our spirituality. Early on in his spiritual journey Francis was searching to discover his place in life, what God wanted him to do. As Fr. Rod Petrie, OFM, a member of our Ministry of the Word team, pointed out yesterday in his homily that in a deep moment of prayer he realized that before God he was a creature, a human being yes, but a creature, one who is created by God, and therefore a brother to all creatures. Understanding ourselves in this was allows us Franciscans to offer to the world a spirituality of connectedness to the created order, seeing ourselves as part of it rather than as standing above it. That is why Francis is seen by the Church as the patron of ecology and we friars and other members of the Franciscan family are entrusted with the task of helping all people to see this, and to care well for the planet on which the Creator has placed us. As for the need to rebuild the house of the Lord , that call is just as true now as it was in the early 1200's when Francis heard this call from the Lord. But beware, many folks, too many I think, hear the call for reform and launch out on angry crusades to change rules or to make sure they are enforced. Francis and the early friars did none of that, they merely lived the Gospel, preaching by their actions, thereby showing others by example how we should be Church. He never denounced abuses, though they were many, he showed the way instead. We need more of that today. A belated happy feast of St. Francis to all! With any of these pics just click on them to enlarge them. We Catholics often focus on the Gospel text when preaching on the Sunday readings. Today however I was struck by the way that the first reading, from the prophet Habakkuk expresses what is in the heart of so many people who endure trial and hardship, turning to God all the time, but being frustrated that God doesn't seem to answer them. For the entire text of the reading just click on the reference below, then click on the reference below. We all ask at times "How long o Lord? How often to I have to pray? Are you Really there?" As normal as it is to raise such questions and as understandable as it is that trial and hardship put faith to the test we need to remind ourselves often that the purpose of prayer is not to get God to do things for us, but to open ourselves to God and to seek deeper union with God. The prophet in this reading tells us that "the vision still has its time, presses on to fulfillment, and will not disappoint. In other words the point is to trust that if we are in God's hands all will be well, even if it doesn't seem so at the time, to be humble enough to admit that God's perspective is bigger than mine. To pray is to go before God with our life just as it is, certainly to express our wishes, but then to let go and trust that if we are in God's hands all will be well. A theologian once defined hope not as optimism, the belief that the glass is half full and not half empty, but rather hope is believing that when the glass is bone dry God will get you through it.